The County of Maui fire, police, and parks and recreation departments, working with the state Department of Land and Natural Resources and the U.S. Coast Guard have published an Ocean Safety Guide to help visitors and residents stay safe in the water. 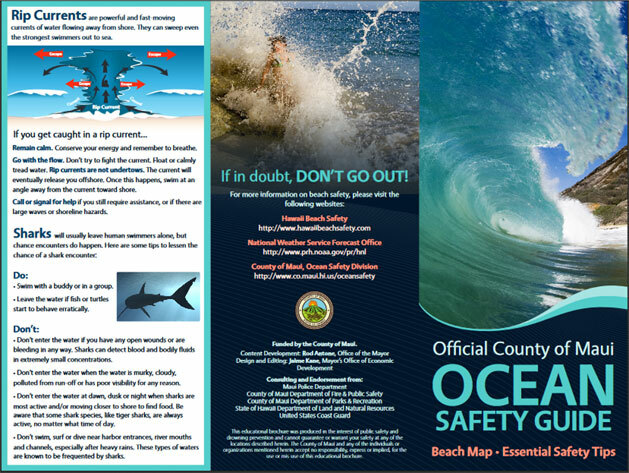 The Ocean Safety Guide contains excellent graphics and tips on water safety and is an excellent resource to make available to guests so their Maui stay is memorable for all the right reasons. It’s a two-page, three-fold pamphlet that owners can print and make available in their rentals, or provide directly to guests with their guest information. RBOAA members on Maui may want to share it with other owners in their building, and ask their AOAO to post it in their property’s common area, too. Water safety is critical in any Hawaii trip, and this County of Maui Ocean Safety Guide is a welcome effort by all agencies and personnel involved.